It looks like the force laydown as we know it in Helmand province, Afghanistan, is evolving. As pointed out in this Marine Corps news release, forces with 2nd Battalion, 3rd Marines, out of Marine Corps Base Hawaii, are now operating out of northwestern Marjah, the former Taliban stronghold that Marine forces assaulted in February 2010. The Island Warriors have forces based at Combat Outpost Yazzie, a patrol base that Battle Rattle readers will remember from my May 2010 embed downrange. That means there’s plenty of catching up to do on which Marine units are based where in Helmand. Last summer, Yazzie was home to forces from 3rd Battalion, 6th Marines, out of Camp Lejeune, N.C. Marines with 3/6 were replaced downrange by another Lejeune battalion — 2nd Battalion, 9th Marines — which was in turn replaced early this year by Lejeune’s 2nd Battalion, 8th Marines. It isn’t 2/8 at Yazzie, though. It’s 2/3, and battalions from 3rd Marines have been deployed on a rotational basis since early 2010 to Nawa, another former Taliban stronghold to Marjah’s east. Part of 2/3 is still in Nawa, but clearly the situation on the ground has improved enough to remove a company of Marines from Nawa. The Island Warriors also are patrolling Sistani, an area to Marjah’s west that 3/6 Marines grew frustrated with last spring. I’d take all this as another affirmation that security situation has indeed improved in Nawa and Marjah. It also makes sense that the Corps was able to pull some Echo Company 2/9 forces out of Marjah late last year to assist in the violent Sangin Valley to the north. 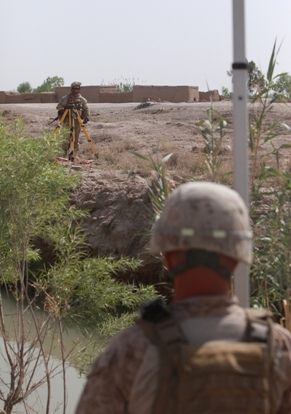 At last check, some 2/8 Marines were still deployed in the Sangin area. Lejeune’s 3rd Battalion, 9th Marines, meanwhile, is based in central Marjah, the turf where 1st Battalion, 6th Marines, wrangled with insurgents most of last summer.